When I started my blog, I thought I was thinking big about running across the country from Philadelphia to Los Angeles. The tracking of the virtual trip across the country was my way of staying motivated through the cold New Hampshire winters. Philadelphia and Los Angeles were just arbitrary points that represented a cross-country trip; the cities themselves didn't mean much to me. I just recently read a post by Mel @ 2nd Chances about a woman who wanted to run 6,436 miles: the distance from her home to where her son was stationed in Iraq. Now that's inspiration! She did it by running on her own and through people donating miles to her all over the internet through her web site milesforbrian.com. All told, she has over 179,000 miles. Wow! Her story is fantastic for so many reasons. First, she hit the road and helped herself stay fit. Second, she did something to distract herself from her son being stationed in Iraq. And, of course, she harnessed the power of a very gracious running community. This community is all about help and inclusion, and there's no better example of both qualities than milesforbrian.com. Thanks for sharing the story, Mel. It's a reminder to all of us to think big! I recently watched "Run for Your Life", the story of Fred Lebow, the grandfather and effectively the founder of the NY Marathon. It starts from the beginning when it was just the New York Running Club and takes you all the way to the present day. 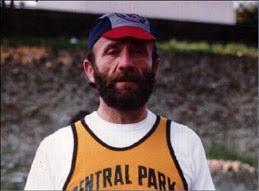 Fred Lebow was both the president of the Running Club and the director of the NYC Marathon. The marathon started from very modest beginnings and was run around Central Park rather than through the five boroughs as it is today. Fred took it from that start and negotiated with the city to make it a tour of the boroughs. Fred was never a fast runner but he knew how to organize an event and get people there. He started as a salesperson in the Garment District in NYC by re-creating famous fashion designs of the day on-the-cheap. He was a knock-off artist. But that also made him a world-class salesman. I absolutely loved this movie (available to stream on Netflix). They do a lot of interviews with people who knew Fred and it shows a real warm picture of the gregarious race director and how he was able to envision it and make it all happen. It shows you some of the odd races that Fred would put on to get notoriety for the Running Club and what goes into running one of the most famous marathons in the world. It's a short movie (less than 90 minutes), and it's definitely worth the time. I recently started writing a guest column at ProLong Magazine, an online magazine started by a friend from college. What I really liked about the magazine is that it looks at the total picture--mind, body and soul, and doesn't just focus on fitness while neglecting the other important parts. It's also written by non-professional writers which appeals to me because, as you can plainly tell, I'm far from professional. In this column, entitled "Visualizing the End to Help You Begin," I talk about the basics of Philly to LA on Foot. It's about how I'm running virtually and how I'm using the map of the US to plot my progress as I run. Visualizing the end has really allowed me to focus on the mundane day-to-day runs by thinking about the fact that there's an end in sight. I'm now in New Mexico on my way to California (more on that in another post) and I'm in the home stretch. Jump on over to my article if you're interested in the beginnings of Philly to LA on Foot and how it's helped me deal with the New England winters.